For this week's Makeover Monday we will be going over the second and final Master Bathroom Design. Our last post was for the wall to the right as you walk into the bathroom. This week's post will cover the wall to the left of that wall, which is all shower, and the wall to the left of the shower. One thing that I loved about our Master Bathroom's shower was that it had new white subway tile. One less thing for us to do! Inside of the shower I would like to replace our current shower head with a gold shower head so that it matches the rest of the bathroom's hardware. On the outside of the shower we have a gold shower rod and an ombre blue shower curtain. In front of the tub a blue memory foam bath mat. If you do not have a memory foam bath mat it is a game changer and I would highly recommend it! I love that the woven fabric adds a bit of texture to our otherwise smooth room. To the left of the shower we have our towel rack. I kept it gold to match the rest of our hardware. The wall is painted light blue like the rest of the room. 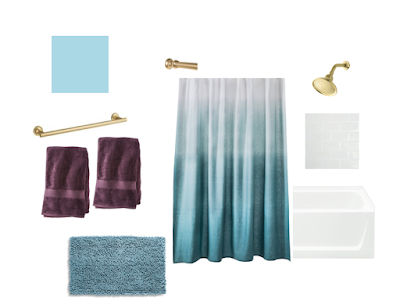 On the towel rack we have two deep purple towels to add in our pop of color. Our Master Bathroom is on the small side but I am just glad to have two bathrooms! What do you think of our bathroom design?